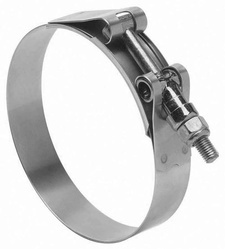 Our customers can avail from us a wide range of Heavy Duty Bolt Clamps. Manufactured using a high-grade raw material, these clamps are known for their widest utility and performance. Available in standard sizes, these clamps can also be customized as per OE specifications. These clamps are suitable for heavy duty method of assembling hose ducting connections and tubings, air-intake systems, duct systems, irrigation systems and more. Available in OE specified widths, thickness, materials, surface finishing etc. Note: Prices are subject to change according to the product size.